It’s widely known that in the 1960’s, out of more than 500 test pilots, Glenn was chosen to be one of the 7 Mercury astronauts. What might be a little less known is that, technically, he shouldn’t have been. During World War II, Glenn had dropped out of college to enlist. That means that he became an astronaut candidate without having a science degree of any kind. In this, and many ways, Glenn was an exception to the rule. What seemed like requirements to many seemed to Glenn to be sort of… guidelines. Options and suggestions. That paradigm didn’t stop with repeatedly orbiting the Earth. He significantly changed career fields no less than 3 times (test pilot astronaut -> soda company executive -> US Senator). What allowed him to do this (beyond the notion of “why not”)? Maybe it was that he loved to go first, and perceived the sheer fact that no one had done something as an invitation rather than an impediment. Perhaps he didn’t feel like age or a less-than-ideal resume should weigh as much as will, skill, and enthusiasm (he was the oldest Mercury astronaut, almost too old to make the cut, and still the oldest man ever in space). Maybe more than anything else, Glenn loved to test life’s perceived boundaries. 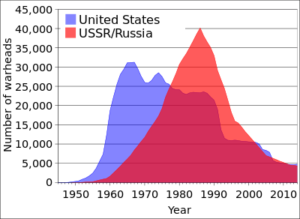 Robert S. Norris and Hans M. Kristensen, “Global nuclear stockpiles, 1945-2006,” Bulletin of the Atomic Scientists 62, no. 4 (July/August 2006), 64-66. Online at http://thebulletin.metapress.com/content/c4120650912x74k7/fulltext.pdf. Open Domain via Wikimedia Commons. I don’t know if any of this is true – and I probably never will for sure – but I do know that I can’t help but feel a kinship with a person who tried things that many considered to be unwise at best and impossible at worst. Regarding the vast and improbable as approachable makes life not only less scary, but infinitely more navigable. Case in point: without Glenn, given time, another American would have circled the globe. What might never have happened was the world-changing Nuclear Nonproliferation Treaty of 1978. How Glenn was able to author and lead this bill to successful passage is nearly beyond me. In 1978, communism was still a looming threat; the memory of the war in Vietnam was a gaping red wound in our country’s soul; and Russian nuclear stockpiles were on the UPSWING, not the down. Thanks to Glenn, we went first down the path to de-arming: ratcheting down the possibility of mutually assured destruction. As a something of a space-walker, I naturally wonder if I would be here if it weren’t for John Glenn. Cruising at tens of thousands of feet in the air, I am grateful to him and to every exception to the rule who went and continues to go first. More than anything else, I am grateful to those who saw where humanity needed to go – to the stars, peacefully – and though it seemed impossible and maybe even a little foolish guided us steadily in that direction – towards the unbroken boundary of the horizon, which fell away at our approach, leading us on to ever newer and greater heights.